New to this sort of system? Easy access to our video guides & fixes mean a problem won't last long! 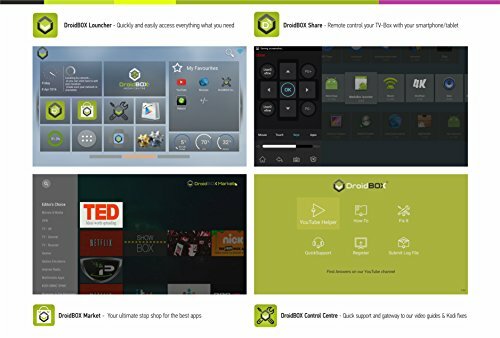 Whether or not Kodi is familiar, DroidBOX's Control Centre is there to help. Our Launcher is designed & developed by DroidBOX just for our customers. Hunting for more media to watch, need apps that can tweak settings or perhaps large screen gaming is your preferred way to pass the time? 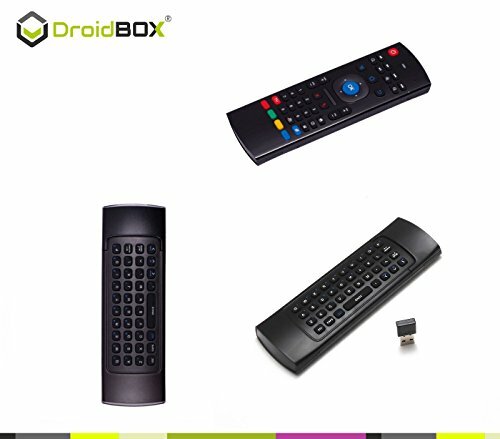 With hand-picked apps that expand the possibilities on offer, DroidBOX Market is your one stop shop! Interactive remote control/streaming system for smartphones/tablets. Stream music/videos to your DroidBOX. Open apps remotely, all with DroidBOX Share. From a DroidBOX device to (effectively) a Chromecast! Cast phone/tablet/PC's YouTube in Chrome. Kodi/DBMC: Think of these as storage. You decide what to store there. If you like films, you would store access to these, perhaps with some music access on top. OpenELEC: Stripped down racer 2nd operating system - increased media playback performance. As time goes on, code tends to be improved and built upon, whether entire applications, Android version or simply a graphical tweak. With updates handled easily & directly on the device, our system ensures you can upgrade with just a few clicks. In today’s review, we are looking at a new device by a company named DroidBOX UK. I’m new to the DroidBOX name. I heard of them first a few months back and this is my first time touching one of their media players. This is actually their flagship T.V. 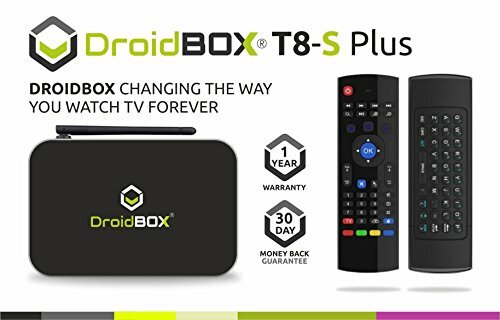 box called the DroidBOX T8-S Plus. Like I said they’re a pretty new name to the Android media player marketplace. This company is actually based here in the UK, so you won’t find their stuff on Chinese reseller sites like Gearbest or Geek, instead if you want to pick up a box you will have to get it either on Amazon or on their own website which is www.droidbox.co.uk. 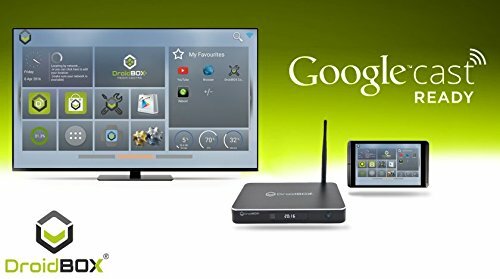 While this is unusual in the world of Android boxes, as usually it is so confusing when it comes to working out who the manufacturer actually is, it’s a great bonus to you and me. 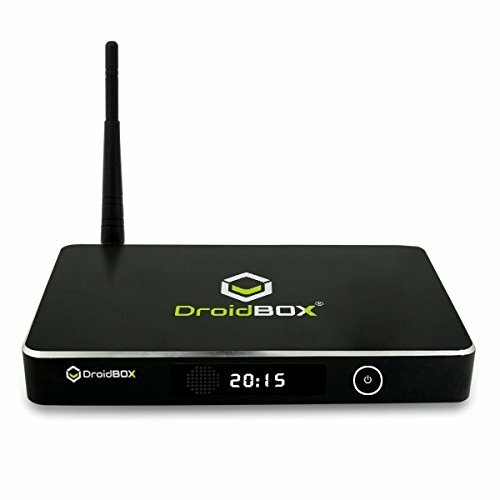 DroidBox offer their own support and their own updates, they also manage their own sales. Everything is pretty much done in-house. So you know that you’re not going through multiple channels and possibly getting lost somewhere in translation. So it’s really an interesting concept and the box itself is actually pretty cool too. 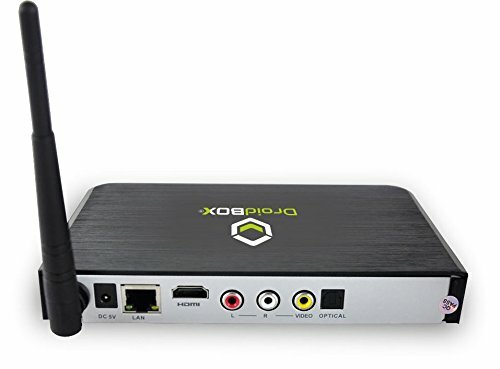 It’s the first dual boot OpenELEC an Android 5.1 TV box that we have reviewed. When you open the box you are greeted with the DroidBOX T8-S Plus. It’s got a really cool look to it in its all aluminium matte black enclosure. It feels really high quality to the touch and feels weighted in the hand, the DroidBOX T8-S Plus is not going to slide around or have any issues with slipping or anything like that! We have chamfered edges on the sides, which is also a nice design touch to let some silver shine through. We’ve seen this with designs from Apple in a lot of their products and is a cool little design feature. To give you guys a quick overview on its specs; again it’s an S812 processor at 2GZ. It has a MALI-450 octa core processors so you get three more cores with this than you do with the Amlogic S905. There are two GBs of DDR3 RAM, 32 gigs of internal storage, which can also be expanded. Then of course there is 802.11ac Wi-Fi, Bluetooth 4.0, and all of the other stuff that you’ve come to expect, but that’s really it for the hardware for now. When you look at the box from the front we have a DroidBOX logo on the upper left hand corner. There’s also an IR sensor for communicating with the included remote control. On the right of the sensor this there is a little LCD screen, so you can configure the box so that it shows you the time for your area. It’s going to give a cool look, more like a traditional TV box. Then we have our power button over on the right for turning it on. There’s also a LED light that goes around the perimeter of this ring and that’s there as a status indicator. On the right hand side, we have a full-sized SD card slot for expanding the internal storage. There’s three USB 2.0 ports for connecting USB accessories and a pin hole for going into recovery mode. On the back we have a DC 5 volt in for supplying power. There’s a gigabit Ethernet port for hard wiring to your local network. An HTMI output for using with H.D. TVs as well as RCA input for video and left or right audio if you have an older television. We have an optical SPDIF for passing through audio to your receiver or to your TV. There is also a Wi-Fi antenna. It is not removable and again it supports dual band 802.11ac Wi-Fi. The last frontier for this TV box is going to be the bottom. We have this panel here that can actually be removed that will allow you to access the guts and inside you can mount a two and a half inch hard drive if you want, so if 32GB is not enough for your media player, you can expand it up to 2TB. You also get a few additional accessories in the box underneath the device. One is the remote control. There’s really not a lot of functionality that you lose out on by using this versus the VIP Plus remote, you can literally do everything except for the Air Mouse functionality. To quickly go overview the remote; we have our usual power button and mute button. There are some color coded buttons that are actually user configurable shortcuts, so you can assign each of those to launch into a specific application. We have three rows here of Kodi specific keys. There’s keys for set up, zoom, your favorites, switching the inputs, subtitles, aspect ratio etc. There’s also media navigation keys for playing and pausing, stopping, rewinding or fast forwarding. We have an android home button, a back button and also a menu button. The cursor is similar to air mouse except that you’re going to be using the directional pad to navigate it rather than the motion of your wrist. So you can move it to the right, you can move it to the left, up or down. You get the idea! There’s a search button if you need to search the OS. We also have volume keys down here as well as additional fast forward or rewind buttons. Down at the bottom we have our one, two, three and our ABC keys. You can switch between these using the function. Then on the top we have the IR sensor. This is how the remote communicates with the TV box and it does require a direct line of sight. So don’t place it in a weird position otherwise you may have trouble using it. Personally, I would probably spring the extra £16 for the VIP Plus remote for the Air Remote functionality, as it is just easier than to always have to point the remote directly at the box! On the back we have a removable door or panel this is for accessing the battery compartment. It takes two AAA batteries to use the remote and they don’t throw any of them in the box so you have to supply your own. And that’s about it for the remote. So I went for the VIP Plus mini keyboard which doubles as an air mouse and a keyboard combo so it has a lot more functionality to it; this remote is really stacked in terms of its functionality! In the upper right hand corner, we have a speaker so if you have a monitor that has no speakers or a TV that requires a receiver or something then you can hear from the remote if you need to. On the bottom, we also have a 3.5mm audio out. You can connect in some headphones or an auxiliary cord to a speaker or whatever you really want it to do. The center part has all of our Android navigation keys. We have a home button, a menu button, a back button, a recents button and volume control keys for decreasing, increasing or muting. This remote is runs on a rechargeable internal battery so that is handy, no more running out of batteries! There’s a directional pad for navigating throughout the UI and also an enter key or an OK key. The little cursor in the center is an air mouse button clicking this or holding it will activate the Air Mouse functionality and what that’s going to do is show you a cursor on the screen. Then to navigate the cursor rather than you having to use a directional pad, you will be able to use the natural motion of your wrist. So it’s going to track the cursor based on the movement of your wrist. On the back of the remote is where it gets really interesting. It has a full QWERTY keyboard. We can enter alphanumeric keys as well. There’s a function button to switch between the two. We have A and B buttons here if you want to do some gaming then you can use this as a gaming remote as well. So that’s it for a look at the VIP plus remote. This is an additional cost (about £16) but it’s definitely worth it in my opinion. We have two final accessories, one being the power supply. Then the final accessory is an HDMI cable. This is for connecting your DroidBOX T8-S Plus to your TV or your projector or whatever display you’re going to be using. So getting down to business, the review of the box! This review is going to be a little bit different to usual due to the DroidBox T-8S Pus’ Dual Boot system which gives the device two operating systems, Android and OpenELEC. So we will be having a look at both operating systems separately to see what the performance is like on each. 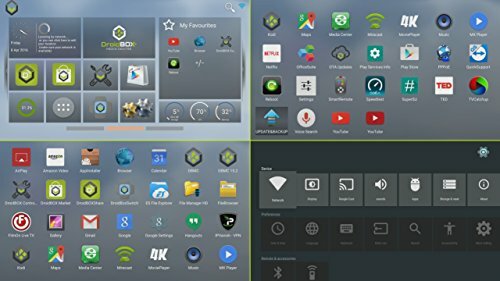 We started with the Android OS, which has a custom launcher developed by the DroidBox team for use on their media players. The Wi-Fi icon in the top right hand corner will activate and turn blue when you are connected, and white if disconnected. DroidBOX Media Center is a shortcut for DBMC. DBMC is a custom version of Kodi that was developed for use on the DroidBOX T8-S Plus and other DroidBOX media players and we’re going to look at video performance within that application in a little bit. There are a couple of apps on the home screen that come in handy. Firstly, if you have a smartphone or a tablet, they have a custom app that you can install on that device that will link it to the DroidBOX T8-S Plus and then you can use that as a remote control. We also have the DroidBOX marketplace. The DroidBOX marketplace is a source for applications that have been pre-approved by their team for use on their media players. A lot of the stuff you can find in the regular a Google Play store but they’ve categorized it in a way that you don’t have to go searching for much on your own. Then we also have the support area here. If you have any trouble with your box or if you just want to read up on how things work or look at instructional videos or how-to’s this area here will get you started. You can also submit log files and register your DroidBOX T8-S Plus as well and then to the right of that is the Google Play store. This of course is just like the Google Play store that you have on your phone or your tablet or that you’ve seen and other Android devices. So you do always have this as an option if you’re not big on how that looks, you want to feel like you’re limited to that UI but that’s it for Android. So here you can see the DroidBOX T8-S Plus running in OpenELEC. If this looks familiar to you at all, It’s probably because you’ve used Kodi. 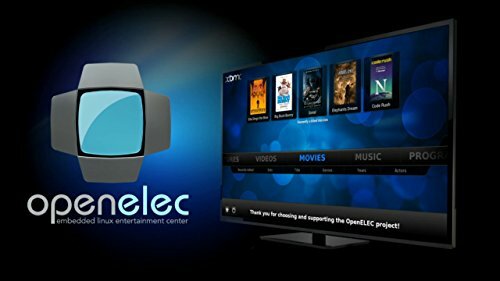 If you’re not familiar with OpenELEC what it actually is is a Linux distribution for home theater PC’s that’s based on Kodi. So it looks just like Kodi and this particular version is actually based on Kodi 15.2. You could see it down here. It’s Version 6.0 for DroidBOX so it’s their custom unofficial build of OpenELEC. We have updates for the operating system that we can toggle to automatically install or we can manually check for them. DroidBOX cloud is an area where you can upload your own content and access it across all of your devices that are linked to DroidBOX. Right now I believe that an OpenELEC it’s limited to just the Kodi configuration. We can also create a system backup for Kodi or we can restore a backup. We can go back to the factory default if we manage to screw something up. We also have an area here to switch the system or reboot to Android. When we go into the video library we can see all the content we have on our network hard drive. I’ve scanned into the library and it’s taken metadata from the internet and associated with all of my movies. So I have artwork, plot summaries and all the details from movies. It’s a really cool way of showing it off to your friends or building a library of all the stuff that you’ve managed to collect over the years. This actually navigates really well throughout the UI. I have a pretty big library I’d say not huge but you know enough that there’s a lot of media to load and it does good. It doesn’t have any issues with loading any artwork or speeds or anything like that. All right so for this part of the review testing video performance in Android, we’re going to be looking exclusively at the DBMC application. I think that since the developers developed this for use on their media players and with the SC12 processor specifically in mind, that we’ll probably get the best performance from this application. So we’re going to be looking at the some test files and we will see how they do! We have some 10 bit 4K stuff and some standard 4K video. So were going to start our video performance testing in Android within the DBMC application. We started off with a 10 bit 4k video, and the quality was quite good, but there was a kind of purple hue over the screen, but 10 bit 4k isn’t even officially supported by this processor so with that in mind that it didn’t do too bad . I mean the video was smooth. There’s just some weird oddities to it. With the standard 4K video file the Space X launch that one played back great. There was no issues there with any discoloring or anything like that. The video performance was solid. We saw that there were some skip frames and some dropped frames but it didn’t affect in any way the video playback. The performance was smooth. There were no noticeable glitches or lag or delay or anything like that. So overall, I would say that it did a pretty good job. It wasn’t perfect but it did a good enough job that it was hardly noticeable if there was anything that was wrong with the video. So let’s switch over to OpenELEC now and we’re going to look at the same exact video files within that version of the operating system. The 4k Space X clip played back flawlessly. There is no issues there with playback performance. The 10 bit 4K file however did not playback at all in OpenELEC. It had a weird lag going on with the cursor also and the video was stuck in the background buffering. So I think that within KODI in OpenELEC 10bit 4K is definitely a no-go. So we do see a few different limitations here than we saw within the Android version of Kodi. Neither of them played that 10 bit 4K file perfectly but it was definitely noticeably better within the Android OS. All right so we are now going to look at benchmarks. On AnTuTu the DroidBOX T8-S Plus scored an overall score of 40,745. This is the highest score that I’ve seen from any Android media player in quite a while. The Amlogic S905 is definitely under powered compared to the SA12 and you can see a difference here of about 5 to 6,000 points compared to other devices that use the Amlogic S905. On 3DMark it got a really good score of 6,047. The S905 with the Penta Core Mali 450 usually averages around 3,500 – 4,000, so this is considerably bigger. It’s at least 33%-40% so very impressive there. Definitely a noticeable improvement over the Amlogic S905 and then here is a look at the details for 3DMark. CPU-Z is detected that the processor is clocked at 1.99 gigahertz. It sees that it has four cores but only two of them are active. It looks like this is probably a limitation of the ROM or something that was done on purpose. We have the Mali 450 MPGPU. It’s eight cores on this one. It’s an octacore. Resolution is 1920 by 1080 with a 160 DPI. The total RAM is actually 1500MB, so we do fall short of that two gigabyte mark, and as of right now I have about 50% about available. Internal storage they market it as 32GB, but on CPU-Z it’s showing 26GB, so it looks like about 6GB goes to the OS. While playing Asphalt 8 I noticed no issues with performance, disconnects with the Game Pad or any issues related to controlling our anything like that, so it gets a thumbs up from me. In terms of how I feel about the media player as a whole I guess starting with the OS’s: first I really like the fact that this was a dual boot media player. I’ve never had a TV box that’s able to switch between Android 5.1 and OpenELEC, so that’s a pretty cool feature. It’s always been Android and Windows, so this is a new one to me. I really don’t have much experience either with OpenELEC but when I played around with it for a few minutes here and there it did great. I don’t think I’ll necessarily be using that over the standard Android OS because I just like to access to everything within one unified operating system such as video playback etc. So to each its own, though some of you guys are probably more accustomed to OpenELEC so it might be of interest to you. With the video playback performance in mind I thought that it was great in both operating systems. The one thing that we saw that was problematic was the 10bit 4k, but the Amlogic SA12 CPU does not officially support that. So it’s not a surprise that it didn’t playback as nicely as we thought it would. It’s just a limitation of the processor so nothing surprising there really. What did take me back though was the resources. I saw that two cores were active in Android, and two cores were active in OpenELEC. I think that maybe the system is allocating two cores to each OS because as the S812 by nature is supposed to be a quad core CPU. It was also a little weird to see the ram was 1500MB. That’s 25% less than what they’re advertising it as. So unless that is being allocated towards the OpenELEC OS I don’t have a reason to explain that. Overall I don’t think it was anything that necessarily affected the media player as a whole. I think it still did a great job with everything else that we threw at it. Super Device: One of the best! Going by the benchmarks, it was one of the strongest media players that we've seen in a really long time. The DroidBOX T8-S Plus is an impressive Media Player.